Map-making has often adapted technologies designed for purposes other than making maps. I recall Scitex hardware as the state-of-the-art in large format color computer mapping in the early 1980s when I was first learning cartography. Cartography applications were developed when Scitex, its origins in designing and printing textiles, noticed “the similarity between printing large fabric surfaces and coloring topographic surfaces.” (PDF source). Step back a few generations and we find the then ubiquitous typewriter adapted to making maps by DIY cartographers. It is safe to say that the majority of persons are seriously hampered in the preparation of text illustrations by the difficulty and expense entailed in the tedious drawing of map, section or diagram. Yet the desirability of greatly increasing the proportion of such illustrations in the thousands of scientific articles published each year is manifest. That clearness, precision and conciseness in the exposition of a theme are generally enhanced by the use of abundant, appropriate diagrams and maps is as evident as that the blackboard is the constant friend of the teacher. Ideally, the author should himself be able to make the original drawing quickly, neatly and artistically. The usual execution of drawing with the pen is, to the average author, discouragingly slow and expensive, not always neat, and still less often artistic. The following note relates to some experiments made to increase rapidity and neatness in the production of line drawings by the use of a machine. Enough success has been attained to warrant the recommendation of the machine method to geologists, geographers, and others. Recently the Hammond Typewriter Company of New York has constructed, for the Geological Survey Department of Canada, a typewriter provided with a carbon ribbon and with ninety special characters designed for the preparation of line drawings to accompany geological and geographical papers. It is to be understood, of course, in the preparation of a diagram that an outline drawing is first prepared, and that the spaces thus formed are filled with the symbols shown in the legends, by means of the machine. 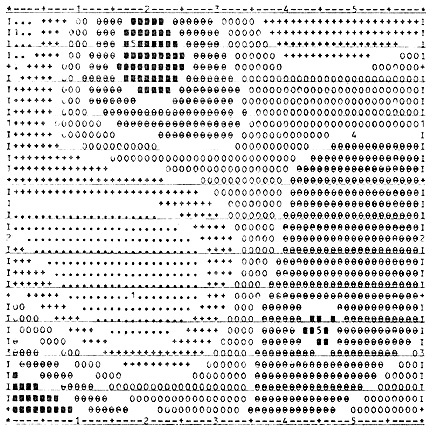 The earliest printed computer maps, such as the map below created with SYMAP software in the mid-1960s, used a line printer. Line printers were, more or less, a typewriter adapted to printing from a computer. A recent book by Nick Chrisman called Charting the Unknown (ESRI Press, 2006) documents the early history of computer mapping and GIS at Harvard University’s Laboratory for Computer Graphics and Spatial Analysis, including the SYMAP software which produced the above map. Source of above quotes: “Machine-Made Line Drawings for the Illustration of Scientific Papers” by R. A. Daly. American Journal of Science, March 1905. 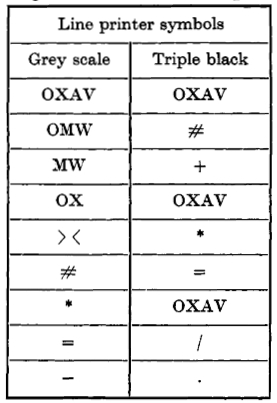 Source of Line Printer Symbols table: R. Mould and C. Wyld, “A comparison between line printer and conventional Polaroid gamma camera displays using a liver phantom. Off-line computer and contour mapping package.” Physics in Medicine and Biology, 18:1, January 1973, p. 88-99. I’m fascinated by this article !! I’m keen on this because i’m actually working on a mapping typography called MAPDINGS, which principle is exactly the same ! 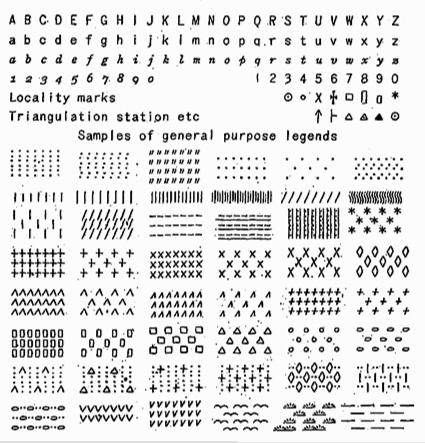 Mapdings font is available for free download, so send me back your creations ! I’m sorry the website is still in french, but you should be able to understand just by visiting the site, watching pictures, and testing my type ! Only needs: pencil, ruller, paper to draw line / map…and only needs 1 known distance, the rest can be calculated by scale..